Crashed into Cubuk Hill in fog, two minutes away from landing at the airport. In-flight structural failure due to severe turbulence. The aircraft was named "Trabzon." Crashed into the side of a mountain. Crashed into the jungle on a domestic flight 20 miles from its destination. Severe thunderstorms associated with windshear and a hurricane is believed to have caused the crash. Shifting cargo caused the pilot to lose control and crash into a hotel. Crashed in snow, low ceiling and fog while en route. Continued VFR flight into adverse weather. The aircraft crashed into the slopes of Mt. Erebus while on sightseeing flight to Antarctica. An incorrect computer-stored flight plan resulted in a navigational error directing the flight towards Mt. Erebus. Because of overcast, the crew descended below authorized altitude. Contributing to the accident was the crew's inexperience with flying the Antarctic route. Information about the navigational errors was suppressed by officials. After being airborne about a half an hour a cabin attendant reported a fire in the aft cabin area. Seventeen minutes later the aircraft crashed into a rocky desert while attempting an emergency landing. The blaze may have been started by a passenger possibly from a leaking kerosene stove carried aboard by a Haj pilgrim passenger. During the descent the aircraft attained a high airspeed and high rate of descent and disintegrated in flight. A progressive failure in the aircraft's electrical system leading to the disabling or erratic performance of some critical flight instruments and flight instrument lighting while the flight was operating in night instrument meteorological condition. As a result of these conditions, the flight crew could not resolve the instrumentation anomalies to determine proper aircraft attitude reference, and became disoriented and lost control of the aircraft. The crew's efforts to regain control of the aircraft imposed aerodynamic loads which exceeded design limits of the aircraft and caused it to break up in flight. The plane descended below the decision height without having established ground contact and crashed into a wooded area. While en route from Chicago to Washington an explosive device detonated in the baggage compartment. The aircraft was flying at an altitude of approximately 34,500 feet, when the flight crew experienced a noise which they described as a thump. Smoke subsequently filled the cabin and the aircraft was forced to make an emergency landing at Washington-Dulles Airport. The bomb was planted by the Unabomber, a man who had been accused of attacks over an 18-year period. He was arrested in April 1996 and subsequently received a life sentence. Aircraft 1,200 ft. high at LOM commenced rapid descent and crashed. Improper IFR operation. The aircraft lost power during takeoff and crashed into power lines. Power plant failure for undetermined reasons. Inadequate maintenance and inspection. Sruck the tower while trying to land in poor visibility. Crashed into a utility pole short of the runway in heavy fog. Crashed on takeoff. Improper loading. Crashed while on final approach. The plane hit a pole, 14 feet above ground level, 2 miles from the approach end of the runway. The localizer was inoperative and the crew was using VOR/DME. Improper IFR operation. Crashed after flying into a tornado watch area. Continued flight into known areas of severe turbulence. The plane crashed after engine failure for undetermined reasons. Improper flap configueration. Plane overloaded. Hurried departure. Inadequate flight training. The plane suffered engine failure on takeoff and crashed. Water in fuel. Improperly serviced aircraft. The aircraft overran the runway and crashed with the left wing and tail separating before the aircraft came to a rest. The crew touched down too far down the runway at a speed higher than normal after a non-stabilized final approach. The crew did not fully apply the braking systems after a touchdown under known adverse conditions. Pilot suffered spatial disorientation after entering clouds. Continued VFR flight into adverse weather. Pilot under the influence of alcohol. The aircraft was on finals when it suddenly turned right and descended in a right wing-down attitude, striking the ground and cartwheeling into trees. The plane was transporting company employees when it hit Surveyor Mountain 7 minutes after taking off from Klamath Falls. The plane hit trees along the crest of a mountain ridge along the flight path. Crew error. The crew's decision to undertake a direct point-to-point high cruise speed flight at low altitude. The aircraft hit a mountain at an altitude of 2,000 ft. during an approach in poor weather. Crew's misjudgement in selection of a low altitude flight profile and inadequate ATC assistance. Crashed into the sea after taking off. The plane undershot the runway and crashed. Crashed on approach after two engines failed leading to a loss of control of the aircraft. The aircraft lost control went into a spin and crashed after an uncommanded flap extension at FL270. Crashed into a hill while making a turn during the approach. Crashed into a wooded area after all four engines flamed out. Fuel contamination. Midair collision at 27,200 ft. Separation error by air traffic controller. Eight-four killed on the 65735 and 94 on the 65816. Fourteen players and 3 staff members of the Russian soccer team, Pakhtakor Tashkent were killed. Crashed en route. Wreckage found in 1987. Ran out of fuel on the initial climb and crashed. Fuel starvation. Fuel selector valves positioned to auxiliary tanks. Flew into blind canyon and crashed into trees. Pilot error. Crashed into the Kiroli Hills while on approach to Bombay at night. Momentary/intermittent loss of electrical contact in the G/S system of aircraft which gave the pilot an erroneous impression of the interception of the glide slope. Crashed due to engine failure on approach. The aircraft crashed 1,000 feet short of the runway during a landing attempt at Akron-Canton airfield. Baseball player Thurman Munson, 32, who was piloting the aircraft, was killed. Munson who was practicing takeoffs and landings, allowed the plane to get too low and then slowed the aircraft to 10 knots below safe landing speed. Crashed into the sea after overrunning the runway while taking off. Locked condition of the elevators which prevented the rotation of the aircraft into a flying attitude. Gust lock became re-engaged during pre- flight check. The aircraft attained a nose-high attitude and pitched up shortly after taking off. The pilot's loss of control of the aircraft after takeoff because of the aircraft's grossly overweight and out-of-balance condition which resulted from misloading by the company's load control personnel. The misloading was due to the failure of the company to supervise and enforce its loading procedures. On a third practice touch-and-go landing, the plane yawed to the right, stalled and crashed in an inverted attitude. Malfunction of the Loran Navigation System caused the pilot to become lost, run out of fuel and crash into the Pacific. The wreckage was never found. Crashed in low ceiling and rain. Fluxgate compass inoperative because of chafed wires. Crashed into a rain forest. Pilot-in-command continuing the flight into conditions where he lost visual reference with the ground which resulted in the aircraft colliding with terrain. Struck Mt. Sebayak at 5,500 ft. during its approach. Pilot error.The plane was named "Mamberamo." The plane crashed in a heavily wooded area about 1.5 miles northeast of Barnstable Municipal Airport while on an ILS approach. The failure of the flightcrew to recognize and react in a timely manner to the gross deviation from acceptable approach parameters, resulting in a continuation of the descent well below the decision height during a precision approach without visual contact with the runway environment. Pilot fatigue. Crashed into Lake Michigan while on approach to Meigs Field. Initiated flight in adverse weather conditions. Spatial disorientation. Crashed into a 16,000 ft. mountain 10 minutes after taking off from Leh. The aircraft crashed into a wooded area during a non-precision approach to Rockland, in fog . Failure to arrest aircraft's descent rate, without the runway in sight. Inordinate management pressures, the first officer's marginal instrument proficiency, the captain's inadequate supervision of the flight, inadequate crew training and the captain's chronic fatigue were all factors in the accident. Crashed into the Atlantic Ocean during a blinding sandstorm. The pilot, unable to land due to the sandstorm headed out to sea for another approach when the accident occurred. The cargo plane crashed in heavy crosswind while attempting to takeoff. Inadequate preflight preparation and/or planning. Pilot in command failed to follow approved procedures,directives,etc. Cargo shifted. During takeoff just, as the plane lifted from the runway, the left engine and pylon separated from the aircraft damaging the wing and hydraulic system which caused the aircraft to roll and crash. Highest single plane death toll in U.S. aviation history. Asymmetrical stall and the ensuing roll of the aircraft because of the uncommanded retraction of the left wing outboard leading edge slats and the loss of stall warning and slat disagreement indication systems caused by separation of the engine and pylon. Improper maintenance procedures used by American Airlines when dismounting the engines for maintenance, by removing the pylon and engine together, putting strain on the engine mounts leading to stress cracks. The aircraft disappeared while en route. Wreckage was not discovered for over 5 years. Tail rotor separated in flight shortly after takeoff. The helicopter autorotated and crashed. Fatigue fracture in tail rotor. During an attempted go-around, the plane struck boat wakes and crashed. One passenger drowned. Crashed into a mountain shortly after taking off. Continued VFR flight into adverse weather conditions. IFR flight plan not filed. Engine failure shortly after takeoff caused damage so the landing gear could not be retracted and increasing drag during the critical climbout phase. Airspeed slowed until the aircraft crashed. The cargo plane lost the No. 2 engine on takeoff, overran the runway, crashed into the ILS localizer antenna, broke up and caught fire. Pilot became disoriented, crashed in snow and low visibility while en route. Pilot not qualified for type of flying. FAA had suspended his certificate. The plane descended too quickly, power was applied but the plane struck trees and crashed. The plane was allowed in below minima conditions. The plane crashed after entering the wake turbulence of a helicopter. The aircarft crashed in freezing rain and fog shortly after taking off. The aircraft was overloaded. The pilot had very little experience flying the aircraft type. The aircraft crashed into a factory after being stolen and flown by pilot who was not qualified to fly. Despite two missed approaches in thunderstorms, the pilot declined the controllers' suggestion to divert to Dubai. The aircraft landed heavily on the runway (due to windshear), suffered landing gear damage, veered off the runway and crashed into a fire station building not far from the terminal building. At that time, all on board were still alive. Fire from spilled fuel started shortly thereafter and there was panic to escape the cabin. The aircraft was named "The City of Petra." The plane ditched into Santa Monica Bay near Marina del Rey, shortly after taking off from Santa Monica Airport. The flight crew's mismanagement of an emergency procedure following an autofeather of the right-hand propeller which resulted in their shutting down the remaining engine. A leak or break in the propeller pressure line probably caused the right engine to autofeather. The left engine was shut down when the flight crew failed to identify the engine on which the autofeather occurred and moved the left power lever to the stop position. Contributing to the accident was the unavailability of vital restart information to the crew. Struck Mt. Bromo at 6,200 ft. while en route.. Missed the approach and crashed in fog and low ceiling. Improper IFR operation. The plane failed to maintain flying speed and crashed while attempting to take off. Improperly loaded aircraft. Nose baggage door opened during takeoff. Flaps inoperative. Improper emergency procedures. Inadequate emergency training. Midair collision with a Beechcraft 99A55. Pilots in command failed to see and avoid other aircraft. 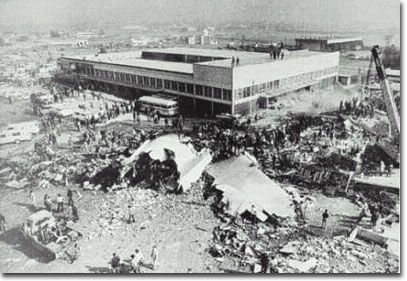 The plane crashed after a bomb exploded aboard. Flew into the water while on ILS approach. The crew was misled by a visual illusion in conditions of reduced visibility into believing they were at a safe height and consequently failed to monitor the flight instruments sufficiently to confirm their aircraft maintained a safe approach path. Shot down by rebels with 2 surface-to-air missiles a few minutes after taking off from Kariba. The plane crashed inverted shortly after lifting off the ground. The captain's decision to take off with snow on the aircraft's wing and empennage surfaces which resulted in a loss of lateral control and a loss of lift as the aircraft ascended out of ground effect. Hit trees and burst into flames shortly after taking off. Contact with the cargo plane was lost 30 minutes after taking off from Tokyo Narita Airport.The cargo included 153 paintings by Manabu Mabe, returning from a Tokyo exhibition, valued at US$1.24 million. Neither the wreck nor the paintings were ever found. The cause of the accident was blamed on cabin depressurization, which killed the crew. Struck a mountain. Failure of the crew to level off at the prescribed altitude either due to inadequate monitoring or an altimeter setting error by confusion between QNH and QFE. Crashed short of the runway on approach. Crew error. Non-compliance with proper procedure, lack of crew coordination, crew fatigue and faulty altimiter. The aircraft encountered air frame icing and wind shear and crashed while attempting to land. Pilot initiated flight in adverse weather conditions. Failed to follow approved procedures. The pilot switched off the de-icing system too early during the approach through clouds in icing conditions which resulted in the aircraft losing longitudinal stability and pitching over and crashed. Midair collision with a Aerostar 600. Pilots in command failed to see and avoid the other aircraft. No anti-collision lights.